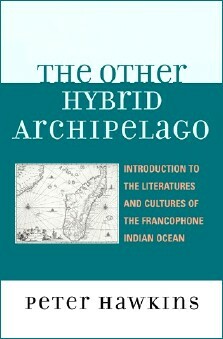 The other hybrid archipelago : introduction to the literatures and cultures of the francophone Indian ocean / Peter Hawkins. - Lanham (Maryland) : Lexington books, 2010. - XV-207 p. ; 23 cm. - (After the empire : The francophone world and postcolonial France). It may be as a result of the beauty of these islands settings, but there is a flavour of redemption in this literary culture. Studying this literature is potentially a rewarding and life-affirming experience (…) ; and it carries within it some possible lessons for the future of our beleaguered planet. NOTE DE L'ÉDITEUR : The Other Hybrid Archipelago presents the postcolonial literatures of the Francophone Indian Ocean islands to an Anglophone audience. The islands of Madagascar, Mauritius, Reunion, the Comoros, and the Seychelles form a region that has a particular cultural identity because of the varied mixture of populations that have settled there and the dominant influence of French colonialism. This survey concentrates on the period since the Second World War, when most of the islands achieved independence, except for Reunion and Mayotte, which maintain a regional status within the French Republic. The postcolonial approach suggests certain recurrent themes and preoccupations of the islands' cultures and an appropriate way to define their recent cultural production, while taking account of the burden of their colonial past. The rich cocktail of cultural and linguistic influences surveyed is situated in relation to the contemporary political and social context of the islands and their marginal status within the global economy. Peter Hawkins is Senior Research Fellow in French at the University of Bristol, UK, having retired from his full-time post in 2008. He taught courses on Postcolonial Literatures in French for many years and held temporary visiting posts at the University of Benin, Nigeria from 1977-79 and the University of La Réunion from 1994-97. He was the first president of ASCALF (Association for the Study of Caribbean and African Literature in French), founded in 1989, and organised many internationally-supported annual conferences in this context at the French Institute in London between 1988-1993 and 1997-2000. (…) ASCALF was re-launched as SFPS, the Society for Francophone Postcolonial Studies, in 2002. He has collaborated extensively with colleagues at the Universities of Mauritius and Reunion and has recently concentrated his attention on the Francophone literatures of the Indian Ocean region.